A 13.5km mountain climb from Katra in the state of Jammu and Kashmir will lead you to the sacred cave adobe of Sri Mata Vaishno Devi which is one of the busiest pilgrim centres in India and draws more than 10 million devotees every year. Thousands of devotees queue for hours to pay obeisance to the goddess’ three forms, Mahasaraswati, Mahalakshmi and Mahakali. One of the most revered pilgrim places of Hinduism, the Vaishno Devi shrine, located on the Trikuta hills, is a steep ascent of 5200 feet from Katra, which is 45km from Jammu. Devotees visit this shrine for fulfillment of their wishes. They are given yatra (pilgrimage) slip on first come first served basis. Temple activities continue round the clock throughout the year. 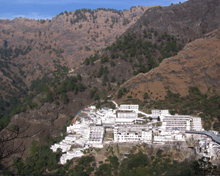 The Vaishno Devi shrine can be visited throughout the year. However, during winter season the route from Katra to Vaishno Devi is often blocked by heavy snow. Even during summer season light woollens will be in need at night. Katra - Banganga (1.5 km), Banganga - Charan Paduka (1.5 km), Charan Paduka - Adhkunwari (3 km), Adhkunwari - Bhavan (7 km). The journey to the holy cave shrine of Vaishno Devi is full of intense religious activity, thrill and joy, but at the same time tough. The journey covers Banganga, the Adhkunwari cave, Sanji Chhat, Bhavan, the cave shrine and the Bhairon temple. A kilometer away from Katra is located Banganga, the place where one is asked to produce the yatra slip which is collected by them from the Yatra Registration Counter at the Tourism Reception Centre near Katra Bus Stand. By showing the slip one can cross the Banganga check post. After trekking six km, one reaches Adhkunwari, the sacred cave where Mata Vaishno meditated for nine months. Another 9.5 km climb will lead the pilgrims to Sanji Chhat where they can have rest for some time. Accommodation facilities are also available at this place. 3.5 km away from Sanji Chhat is located Bhavan. Here helipad is used by those who prefer to visit Vaishno Devi shrine by helicopter from Katra. Now it is your turn to visit the cave shrine. 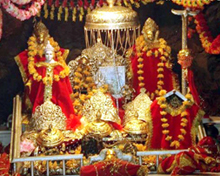 Where Vaishno Devi is present in her three pindi forms -- Mahakali, Mahalakshmi and Mahasaraswati. After the darshan you have to visit the shrine of Bhairon, 2.5 km. from Bhavan. A visit to Vaishno Devi is considered complete only after a visit to the shrine of Bhairon located in a place called Bhairav Ghati. The entire route has been re-laid, widened and tiled recently. 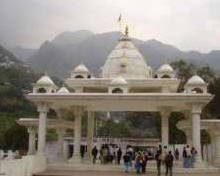 Devotees can avail facilities like rest shelters, drinking water fountains, ‘bhojanalays’(restaurants), cafeterias and coolers and public utility along the Katra – Vaishno Devi route. Ponies, Pithoos (coolies) and Dandis are also available on the route for those who are not able to trek on foot. 15 Km from Katra on way to Salal Dam, the place is home to a naturally formed Shivling set amidst the breathtaking landscape consisting of small cascading waterfalls. 100 km from Vaishno Devi shrine, the breathtakingly beautiful hill resort of Patnitop is located at a height of 2024 m from the sea level. Patnitop is an ideal destination for spending a memorable holiday far from the madding crowd. 17 km from Patnitop is the cup-shaped meadow of Sanasar known for its lake. Sitting in the lap of thick bands of lofty conifers on the mountain slopes, the place is ideal for adventurous spirits who can indulge in paragliding. Situated on the banks of the Jhajjar river, this beautiful destination is a favourite with the picnickers. Jhajjar Kotti is 19 km from katra. Also called the City of Temples thanks to the profusion of temples dotting the landscape, Jammu is 61 km from the Vaishno Devi Shrine. The winter capital of the state of Jammu and Kashmir is the reference point for the spiritual and natural attractions. Raghunath temple, Ranbireshwar temple, Pir Khoh and shrine of Pir Badhan Ali Shah are sacred places in Jammu. For the history buffs and lovers of architecture, Bahu Fort and Mubarak Mandi Palace in Jammu are the places to be. Akhnoor, Jhajjar Kotti, Purmandal- Uttar Behani, Surinsar Lake, Babor (35 km), Kirimchi Temple, Baba Dhansar, Jassota Sanctuary, Dera Baba Banda, Mansar Lake, Reasi and Holy Cave of Shiva Khori are some of the famous excursion sites from Jammu located with a radius of 100km. 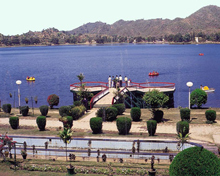 70 km from Katra, the heart shaped Surinsar Lake is set in the midst of a picturesque landscape. 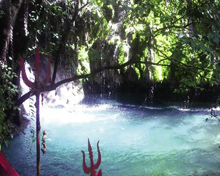 75 Km from Katra, Holy Cave of Shiva Khori attracts devotees who come here after a 3 km. trek from Ransu. The cave enshrines a naturally formed ‘Shivling’. Thousands of devotees throng the place during a fair on the eve of Shivaratri. 90 km from Katra, this picturesque lake is surrounded by hills. The presence of old palace on the shores of the lake adds to the charm of the place. Air : The nearest airport is Jammu which is 61 Km away from Katra. Helicopter Services are operational from Katra to Sanji Chat. The flight is of 8 mts duration. The helipad at Katra is 2 Km from the Katra bus stand and Vaishno Devi Bhavan is approximately 2.5 Km from the helipad at Sanji Chat. Rail : Katra is the nearest railhead connected with Delhi. Jammu is the nearest major railway station connected with major cities and places in India. Road : Katra is well connected by road with different cities, towns and places in India. Buses leave for Katra from Jammu every 10 minutes. 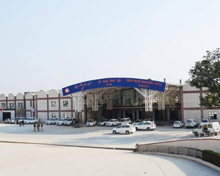 Taxis are also available at Jammu Airport, Railway Station and the Tourist Reception Centre, for travel to Katra. From Katra, it is a 13.5 km trek to the Vaishno Devi cave shrine. Yatri Niwas, Guest House, Tourist Bungalow and Reception Centre managed by the Shrine Board and the J & KTDC provide reasonably priced accommodation at Katra. Sarais, managed by the Shrine Board provide accommodation facilities at Adhkunwari and Darbar. Dharamshalas run by various organisations offer reasonable accommodation to the pilgrims.